Digital UltraViolet and Digital Copy will makes it possible for you to stream the movie Hunter Killer HD UV or iTunes Code instantly to your computer and compatible Smartphones, Andriod, iphone, iPod Touch, iPad and tablets devices anytime, anywhere. 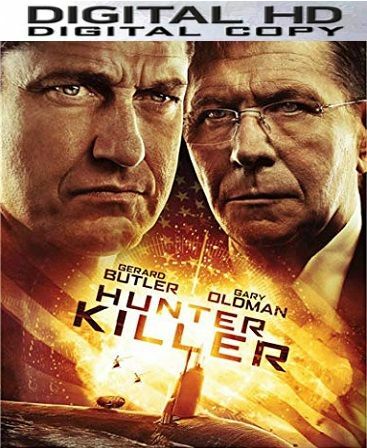 You can also download a Digital UltraViolet Copy or a Digital Copy of the movie Hunter Killer HD UV or iTunes Code to your computer and compatible devices. This review is based upon seeing the movie and not the actual Blu-Ray, which has not been released at the time this is being written. I had waited quite awhile for this movie to be released since I saw the initial trailers and it was definitely worth the wait. I have probably seen every submarine movie ever made and have to say that this is the best one I have watched since The Hunt For Red October was first released in 1990. The two movies are very similar in a number of ways, but I am not going to give away any spoilers here. Unfortunately, the movie starts off with some horrible CGI. Thankfully, the rest of the film makes minimal use of such crappy special effects and is mainly a live action picture. The action starts only seconds into the film and never really lets up. The pace is like a roller coaster that never slows down. There are very few opportunities for the audience to catch their breath and your eyes are pretty much glued to the screen from start to finish. Gerard Butler can give hit and miss performances, but in this film he definitely brings 110% Most of the rest of the performances are good as well, but Butler really steals the screen. The tension that he helps bring to this movie really cements it as a first class action/suspense thriller. Other than a few scenes with less than great CGI, the production values are all first rate. The interior of the submarine is especially well done. Nothing in the film looked especially fake and it is evident that the producers paid a great deal of attention to detail. Although there are some very small lapses in continuity here and there, for the most part this film does an excellent job when it comes to realism, especially in regards to details having to do with the U.S. Navy. The final action scene outcome is something that you could not possibly have seen coming unless you know quite a bit about Naval weapons systems. Whoever wrote the original novel that the film is based upon definitely knew their stuff. There isn't a lot of personal drama in this film or side stories that detract from the main story. It's a very tight film that is excellently directed and edited. Although it runs around 2 hours the time flies by as you are pretty much on the edge of your seat the entire time. As submarine films go, I would definitely consider this in the top 10 of all time. This is one of those few instances where the film actually lives up to the hype of the trailers and then some. I will definitely be pre-ordering this title for when it is released next month. I can't wait to see it again.